Inland the landscape is as alluring as the coast. The mountainous countryside and scenery of this tranquil island is astonishingly beautiful, especially in early summer when wild flowers create a colourful perfumed carpet across the hillsides. 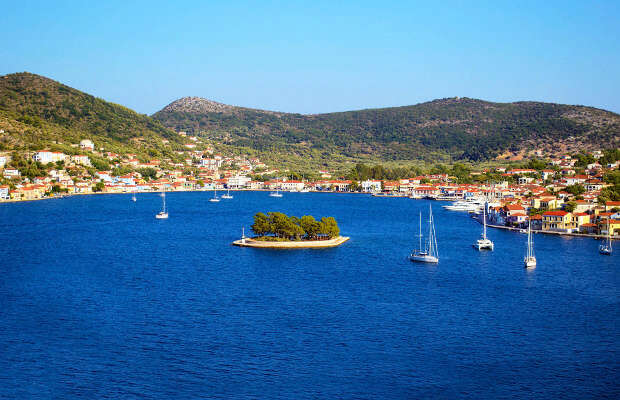 Heading west from Vathy, as you pass over the high ridge above the bay of Aetos, you could be forgiven for thinking that Ithaca is almost two islands in one. Looking across the straits to Kefalonia and only 600m wide, this narrow strip connects the northern and southern peninsulas and is a favoured spot for walkers. Nearby, a steep mountain track leads you to the 16th century monastery of Kathara, on the slopes of Mount Neritos. From here, the view back towards Vathy harbour is magical. The traditional northern village of Stavros (meaning crossroads in Greek) boasts some fine churches, an imposing bust of Odysseus and some of the island’s most respected restaurants. 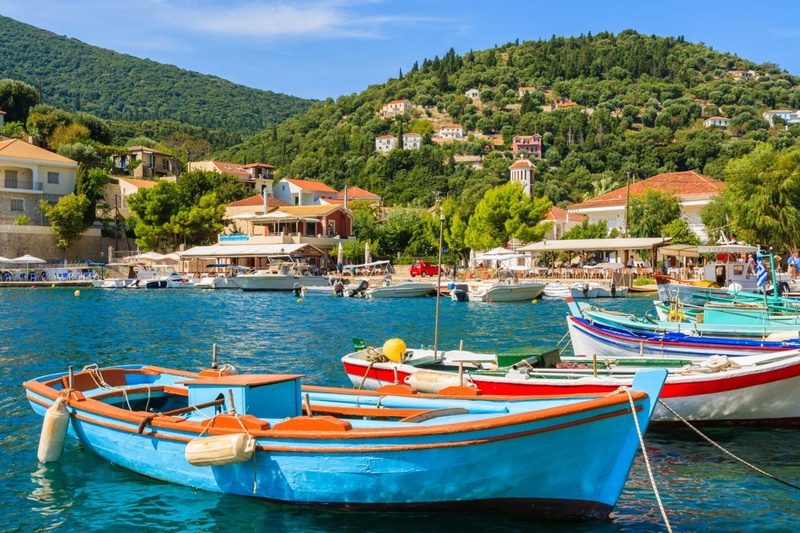 From Stavros, drop down through the lush valley to the tiny harbour and port of Frikes, a sleepy seaside village with dazzling white stonewashed houses, luxuriantly decorated with bougainvillea and jasmine, and a good selection of unpretentious waterfront tavernas. Beyond Frikes, follow the scenic coastal road to the atmospheric harbour of Kioni. Here, smart houses punctuate the hills around a secluded horseshoe bay of this extremely pretty Greek village. Numerous small, secluded and dazzling white pebble beaches grace Ithaca’s coastline among them the delightful bays of Filiatro, Sarakinikos and Gidaki, all extremely pretty and all seldom busy, even in the height of summer. Awarded the coveted Blue Flag for clean water and environmental protection, the beach at Dexia merits particular attention. A ‘panigiri’ is the celebration of the patron saint of the village and like all of Greece, the villages in Ithaca celebrate the day with food, drinks, music and dancing, usually until late in the evening. At the end of June, the village of Frikes celebrates the Twelve Apostles whilst Exogi celebrates St Marina mid July. The village of Kioni has two festivals in July: July 20th is dedicated to St Elias and on July 24th the feast day of St John (Agios Ioannis) takes place. There is a wine festival on the last Saturday of July in Perachori. August sees the biggest event on the island: two days of fun in Stavros for the festival of Sotiros. Tserepa chicken features on many menus and is a delicious chicken casserole, marinated in olive oil and garlic, cooked with tomatoes, lemon juice, potatoes and peppers, and seasoned with oregano. The Tserepa is the clay pot in which it is slowly cooked, traditionally over characol. For something sweet, try Rovani, a traditional sweet made with ground rice, honey, sugar and olive oil. As Ithaca does not have its own airport all flights arrive to the neighbouring island of Kefalonia. The best choice of charter flights are from Gatwick, Birmingham and Manchester with Newcastle and Luton also served. We can arrange a choice of transfer options from Kefalonia airport to the ferry port and onward to Ithaca; prices on request. The capital of the island, Vathy, benefits from one of the most idyllic seafront settings in all Greece. Invisible from the open sea, its narrow fjord-like entrance, guarded by twin headlands, each adorned with the ruins of Venetian gun emplacements, and overlooked by Mount Neritos, the island’s highest peak. Nestling in the middle of the sweeping harbour sits the tiny islet of Lazaretto with its picturesque, whitewashed church while around the edge of the sheltered bay small boats bob in clear waters alongside local tavernas. The pace of life here is laid-back. At most! Perched just above Vathy, the traditional village of Perachori, is the centre of Ithaca’s wine production and home to several small tavernas renowned for the freshness and quality of their food. 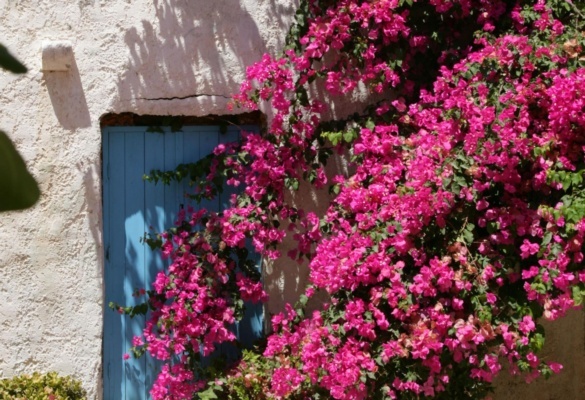 Stavros village was built in the 16th century but offers today’s visitors a chance to immerse themselves in the Greek relaxed and laid back way of life. The village has good amenities to offer visitors and family-run tavernas to sample tasty local cuisine. Within easy reach of a choice of beaches and the azure Ionian Sea it’s easy to spend a day or two exploring secluded coves, snorkelling, swimming and soaking up the sun. Explore the area by car and discover remote mountain villages and little harbours with waterfront tavernas.